Today’s post is short and sweet, just like this week has been! I had an amazing weekend in Portland racing in my first triathlon and I’m off to Nantucket today for a long weekend vacation. More to come on the triathlon later; my suitcase is calling! Still figuring out what to do with the spring onions and carrot greens – any ideas? This week’s box has corn! There is seriously nothing better than fresh corn in the summer – am I right?! Welcome to July – when everyone in New England regrets all of those winter wishes for warmth (realizing that with warmth often comes humidity). It has been hot and sticky around here all week with scattered thunderstorms. It’s the time of year when turning on the oven is painful (doesn’t stop me though). I’m happy to report out that my first encounter with callaloo was a win! I sautéed the leaves with carmelized onions and topped it with freshly grated parmesan cheese – YUM! (To be honest, pretty much everything tastes good with carmelized onions and parmesan cheese, this was no exception). The callaloo felt like a mix between spinach and kale – a mild flavor but a heartier texture than spinach. I made a Jamaican inspired chicken by marinating a chicken breast in a blend of jalapeno and green onion (just throw the veggies the blender with some salt, pepper, and vegetable oil, marinate overnight). Italian sausage and quinoa stuffed summer squash (recipe coming soon!) served with a mixed green salad. Sauteed callalloo with carmelized spring onions, served with chicken marinated in a blend of spring onion leaves and jalapeno. More basil pesto, which I froze to use in soups, pastas, and other dishes. There is still a leftover cucumber in my fridge – not sure how it will go to use, right now I’m thinking more pickles. 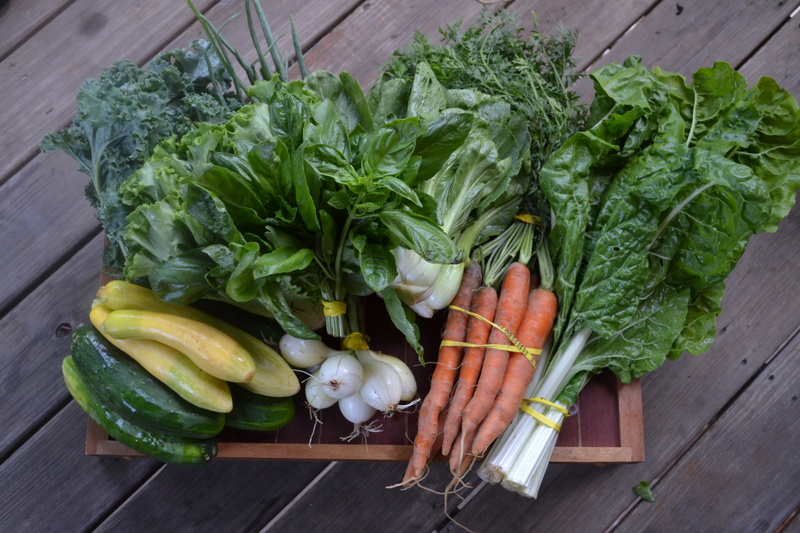 Coming up next week: carrots, green chard, and the return of the not-so-baby bok choy. Suggestions welcome! Anyone else feel like this week flew by? I’m honestly having a bit of writer’s block as I think back over the past week and try to write this post. Now is as good a time as any to share that I have been training for a triathlon for the past 10 weeks. And I’ve become obsessed, especially in the last month. I eat, sleep, and think training – and I’m only doing a sprint (the shortest version of a triathlon). 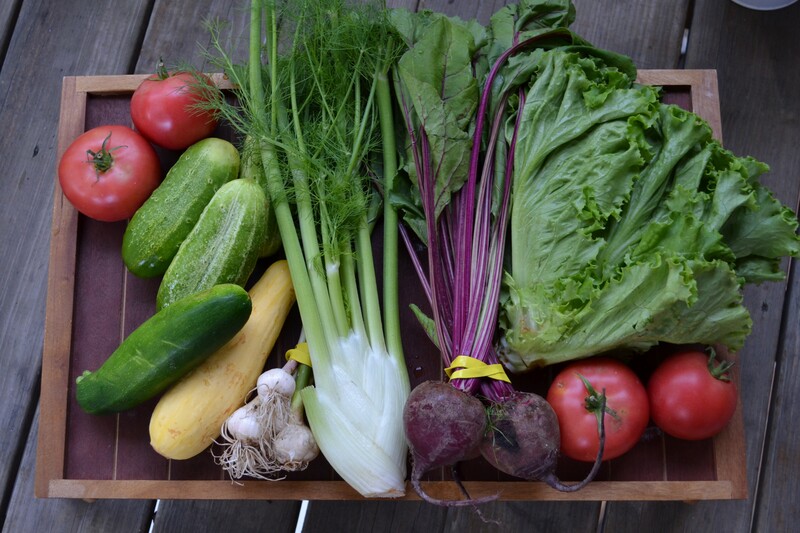 It has been a huge help to have a box of fresh, beautiful vegetables delivered each week – it takes the pressure off of meal planning in between workouts and lot’s of sleep! I’ll share some pictures and reflections after the race – it’s right around the corner (wish me luck). Salsa with greenhouse tomatoes, cucumber, onion, and corn. Served with shrimp tacos and homemade tortilla chips. Fresh basil pesto with spring garlic. Salads with romaine lettuce, cucumber, steamed beets, and sautéed zucchini and summer squash. Grilled cheese sandwiches with pesto and sautéed zucchini and summer squash. Sauteed beet greens that I froze to use in a soup some time this fall. Homemade fridge pickles from the extra pickling cucumbers. Week 2 of the farm share is here, and I have to admit I was pretty intimidated by this one. Last week I said I was drowning in vegetables and this week I was drowning in dark green leafy vegetables (not a bad thing in either case). I revisited the thought of purchasing a juicer but decided that is a better item for my Christmas list. The strategy? Start with the greens likely to go bad first. 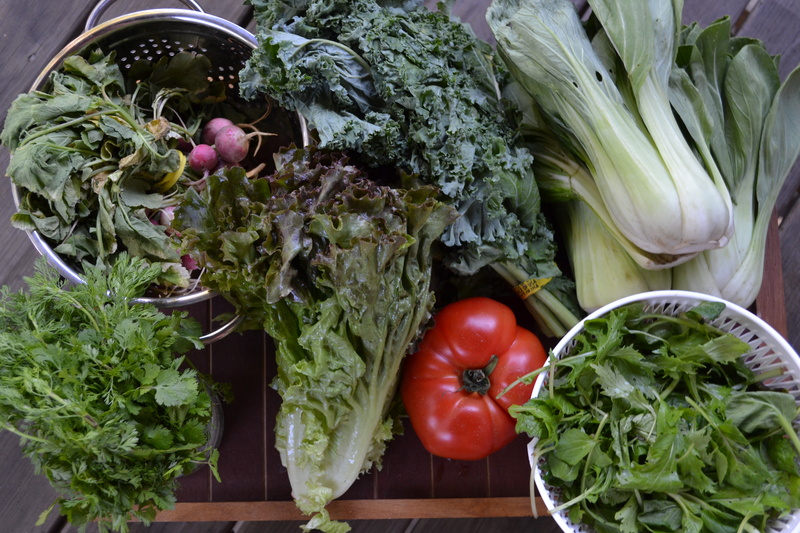 The hearty greens, like kale and chard, had a better chance of lasting through the week. They also are better to sauté and freeze, so in the worst case scenario I could resort to that. So I attacked the red leaf and romaine lettuce first, with the spinach, chard, and kale on the back burner (or should I say, back saute pan!). 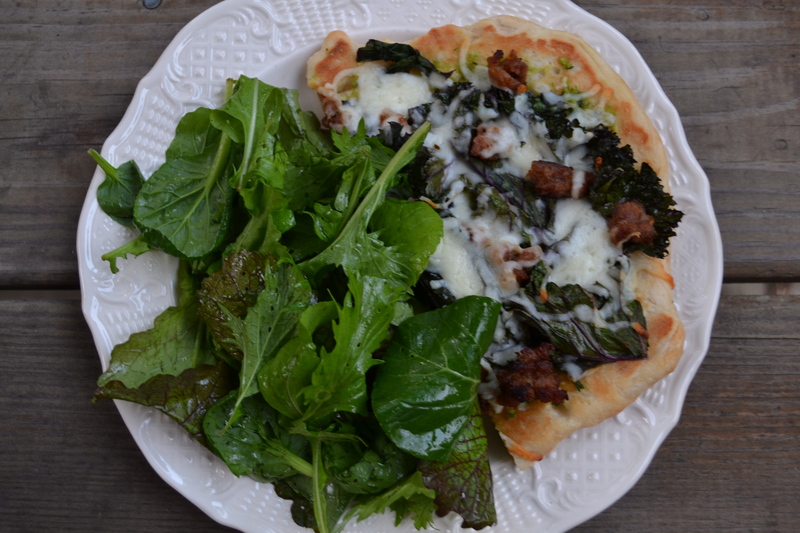 Pizza with a garlic scape and parsley pesto base, topped with sautéed red kale, hot Italian sausage, and mozzarella cheese. Served with a side of mixed greens tossed in olive oil and apple cider vinegar (pictured below). Salads of romaine and red leaf lettuce with tomatoes, steamed beets, quinoa, and onion. A tomato, beet greens, and half of the romaine lettuce are going with me to Newport, RI this weekend – hopefully we’ll find a way to use them! Any surprises in your box this week? 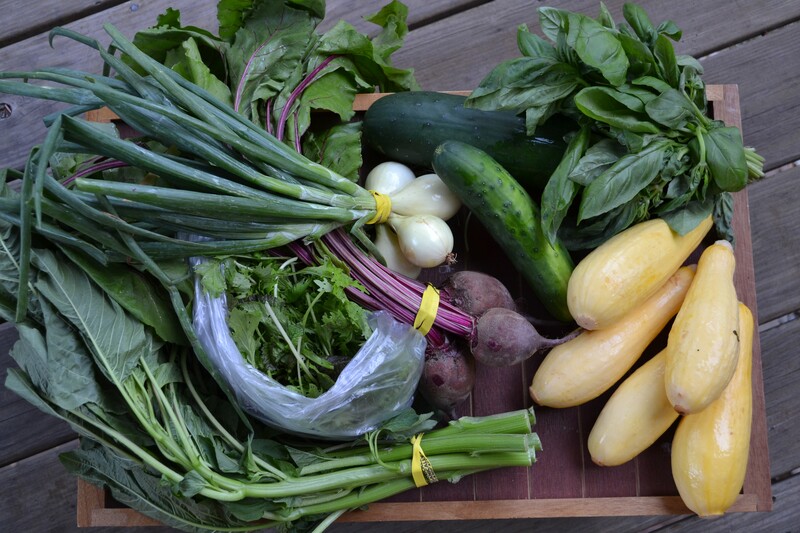 After a two week delay due to weather complications, FARM SHARE SEASON HAS ARRIVED! I have wanted a farm share for years, and I am finally the owner of one medium share from Enterprise Farm (read more about my obsession here and here). 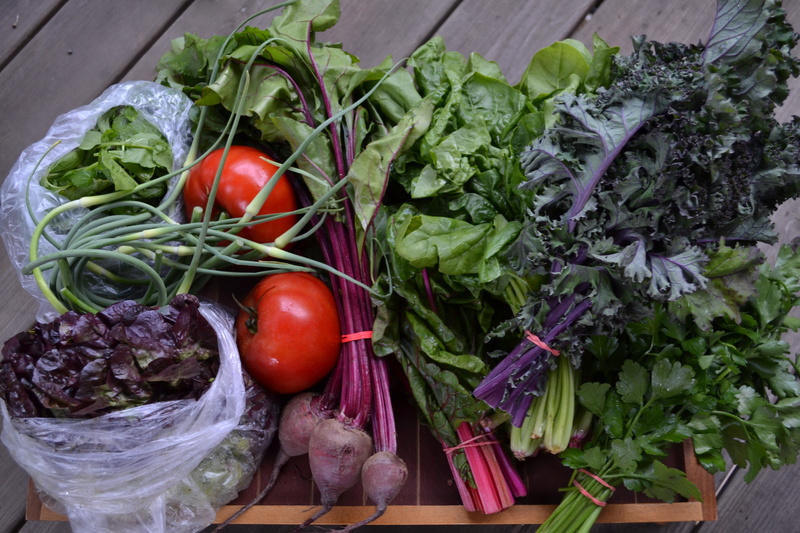 To share my farm share joy with all of you, I plan to post a short Farm Share Friday post each week, summarizing what was in my share the week before and how I used it. 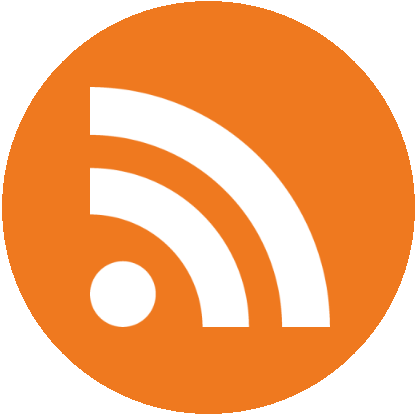 The plan is short and sweet, with simple descriptions of how I put the share to use. Let me know what you think as we go! Above is a picture of my gorgeous first share – such bright, fresh colors! I’m a little scared because I already feel like I’m drowning in vegetables (in a good way, of course). I can’t wait to see what the farm has in store for the rest of the summer and fall. Cilantro sauce: pulse 1 bunch of cilantro, a garlic clove, salt, pepper, lemon juice, and olive oil in a food processor. Served over pasta and chicken. Field greens with a simple dressing of olive oil, apple cider vinegar, honey, salt, and pepper. Served with pasta and cilantro sauce. Enjoyed on my deck on Friday night with my best friends. Possibly my favorite share item this week. Kale smoothies: steamed kale with pineapple, green apple, ice, milk, and honey. Salads of red leaf lettuce, radishes, tomato, edamame, and quinoa. Enjoyed for lunch every day this week! Roasted bok choy served beside pasta and meat sauce. Slow roasted tomatoes (in the oven at 250 for 3 hours). Do you have a farm share? What was your favorite item this week?